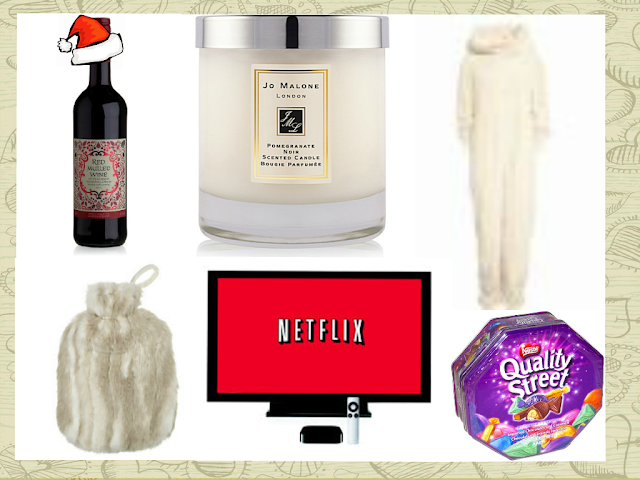 Lou Loves Beauty: Perfect Cosy Christmas Night in. Perfect Cosy Christmas Night in. Christmas is nearly here and I'm buzzing with excitement! The thought of waking up on Christmas morning, seeing the faces of my son and husband as they open their presents, carols playing in the background and bucks frizz bubbling away. As with most people I love going out over the festive period, but what I love even more are cosy nights in, The Christmas tree twinkling in the corner, the heating turned up to full power, an alcoholic beverage and delving into the chocolates meant for Christmas day. Above is my perfect Christmas night in, Mulled wine, Cosy onesie, Hot water bottle, Plenty to watch on the box, the room smelling of Christmas and feeling rather sick at the amount of choccy's that have passed my lips!...that to me is perfection! What is your ideal Christmas night in?